The common green capsid, and the apple capsid bug are both sucking insects. Adults vary in colour from green to red/ brown, around 6mm(¼") in length, and have a long, slender feeding tube. The young are similar in shape and colour, but smaller and wingless. Both adults and nymphs feed on the sap of young growths in spring,and inject toxic saliva that kills plant tissues. There can be one or two generations per year depending on the species. Eggs are generally laid into cracks in tree bark, and hatch in late spring. Depending on species, over-wintering takes place as eggs or as adults in plant debris. Damage is often seen as either tattered and or puckered leaves, plus the buds can often be distorted. Similarly, growing points can die, and developing fruits and flowers can be mis-shaped and discoloured. The apple capsid bug damages the foliage in a similar manner. It may also feeds on the young embryo apples, resulting in raised corky scabs developing on the skin of fruit when it matures. These scabs are only skin deep and do not affect the eating and keeping qualities of the fruit. 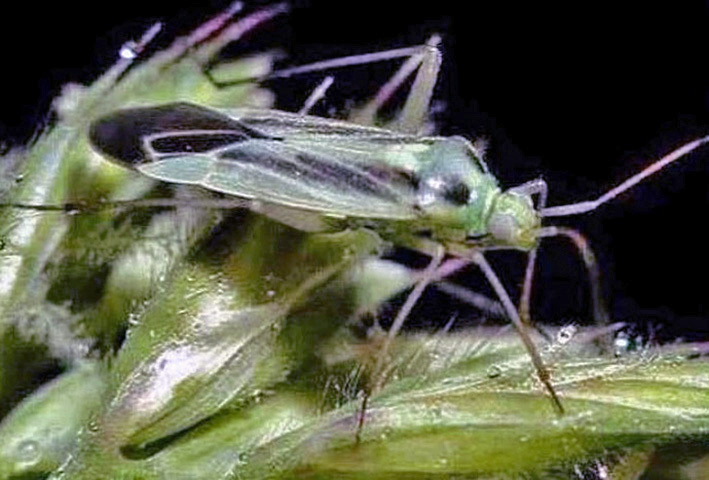 Capsid bugs move rapidly and have usually left the damaged plants long before the symptoms are apparent. It is difficult to prevent damage, but using a suitable spray in the winter to deciduous hosts, such as apples and currants, should kill over wintering eggs. Summer infestations on ornamental plants may be reduced by thorough and frequent spraying, and or manual removal. Some capsids over winter in plant debris, and in leaf litter. Removing weeds from around plants, and keeping areas around plants free from plant debris will reduce this problem.